Cancers can occur in various areas of the head and neck. Most of them originate in the moist tissues that line the mouth, nose, and throat, such as the salivary glands and sinuses, but also can develop in the lymph nodes of the neck. Men are twice as likely to have head and neck cancers, especially those who use tobacco (smoking and smokeless) or alcohol. Another risk factor is infection with HPV (human papillomavirus). In order to diagnose head and neck cancer, your doctor must conduct a physical exam and diagnostic tests, including a biopsy in which a sample of tissue is removed and examined. 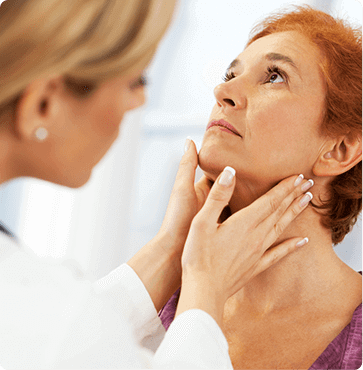 If detected early, head and neck cancer is often curable. Possible treatments include surgery, radiation therapy, chemotherapy, or a combination of these, some of which can affect eating, speaking, or even breathing. In that instance, patients may require rehabilitation. If you experience any of the symptoms listed above, it’s important to see an ENT specialist as soon as possible. The board-certified otolaryngologists at Austin ENT Clinic are specially trained to diagnose and treat head and neck cancer. Request an appointment online or call our office at 1-800-876-EARS (3277) to arrange a consultation.